Hatchbacks are great because of the cargo space they offer as well as their efficiency. What if you could have a versatile, spacious hatchback that drove like a sports car? Let's be honest, there seems to be a conception that hatchbacks can't be sporty or fast. Well, the Golf GTI is doing its best to break that belief wide open. We already know the Golf to be a compact, easy to drive, practical car. So, let's beef it up a bit. The highly efficient Golf comes with a standard 1.8-liter I4 engine powered by 170 horses. The Golf doesn't have any other engine options, which is understandably frustrating for those seeking a bit more thrill. The 2018 Volkswagen Golf GTI comes with a bigger 2.0-liter I4 engine with a much more impressive 220 horsepower. And it is available with a six-speed manual transmission, compared to the Golf's five-speeder. Even with the stronger engine, the Golf GTI still averages up to 33 highway MPG. There is more to this car than its engine. Continue reading to learn more. There's no doubt that you will love driving the GTI. Its low-to-the-ground body contributes to its driving style, and the improved engine roars louder than before. The fun continues inside the cabin. 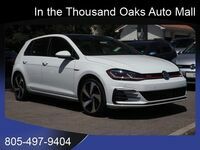 The Golf comes available with satellite radio, so you will have a seemingly-infinite amount of selections to listen to that you never had before. Navigation with voice activation comes available so getting around unfamiliar areas is easy as ever. All models and trims of the Golf GTI come with Bluetooth compatibility as well, so your smartphone can always be connected. Also available on the new Golf GTI are advanced safety technologies. Parking assist, lane-departure warning, and a blind spot monitoring system are all available features that help to maximize your safety. While the GTI offers the same amount of room as the original Golf (they're almost identical in size), it still is very spacious. Just under 53 cubic feet of interior cargo volume can be found in the rear of the golf when the back seats are folded down. We don't think you'll have issues packing up luggage for a long road trip as long as your passenger load stays smaller. Contact us with any other questions you have on the new Golf GTI. Our inventory is always changing, so even if we don’t have the newest model in stock, check back again soon! Meanwhile, you can schedule a test drive of any other vehicle we have, and you can schedule it online! We hope you come by soon.